In 2016, 33 lions freed from circuses in Peru and Colombia were transported to South Africa to live out their days in a wildlife refuge. Last week, poachers broke into the sanctuary, killing two of the big cats. The killing of the male lions named José and Liso occurred at the Emoya Big Cat Sanctuary, which had portrayed the lion airlift as a compassionate gesture that alleviated the suffering of animals held in cages and subjected to beatings and other mistreatment. The incursion highlighted how brazen poachers can infiltrate places like Emoya, which said it has 24-hour security and armed patrols and has taken additional measures to protect its property in Vaalwater, in northern South Africa. South African police and anti-poaching units are investigating, said Animal Defenders International, a group that worked on the lion transfer from South America. The group said it is considering the offer of a reward for information leading to conviction, and that the other lions might even be evacuated pending security upgrades. No details about the possible motive for the lion killings were provided. In January, poachers cut through fences at another animal park in South Africa and decapitated and chopped the paws off three male lions, possibly for use in traditional healing rituals. While lion parts have long been used in some African cultures, conservationists have raised concerns that poachers are increasingly targeting lions because of demand in some Asian countries. African lion bones are a relatively recent substitute in tonics for the bones of Asian tigers, whose numbers were depleted by poachers. Lion teeth and claws are known to have value as trinkets. 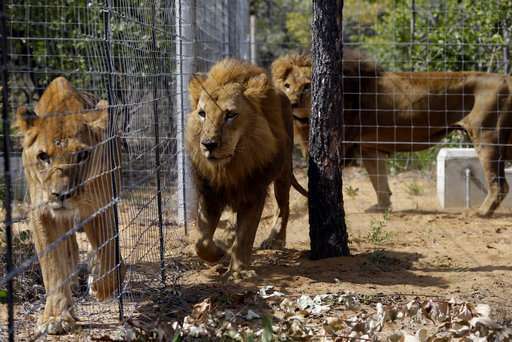 The transfer of the lions to Emoya had no conservationist value because the animals, which were in poor condition, had been held in captivity and could not live in the wild. The former circus lions are provided with game meat and water in large enclosures. Rapunzel, one of the 33 lions, died of a botulism toxin at Emoya in June 2016, a little over a month after the airlift from South America, according to the sanctuary's website. "Animals are normally resistant to this kind of bacterial toxin but rescue lions that have suffered a lifetime of malnutrition and abuse can sadly remain vulnerable to diseases despite rehabilitation efforts," the sanctuary said. Animal Defenders International said one of the two elderly lions killed last week had suffered brain damage from head blows in the circus. Not only animals are endangered.